BRUSSELS, Belgium -- New Ukrainian President Viktor Yanukovych is likely to bring stability and security to energy relations with Russia, the European Union executive told member countries on Friday. 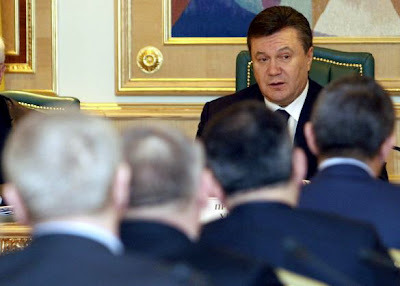 Ukrainian President Viktor Yanukovych addressing ministers in the newly formed government in Kiev. A briefing paper for EU energy ministers meeting in Brussels said Yanukovych looked likely to revise existing contracts for delivery of Russian gas to Ukraine and onward to Europe. "Energy relations with Russia are nevertheless likely to improve, and so far Naftogaz has been able to meet its gas payment obligations," said the report, referring to Ukraine's state-owned gas company. Europe has closely watched the relationship between Kiev and Moscow since a pricing dispute in January 2009 cut off supplies to the continent during three weeks of freezing weather. "The main challenge for the new president will be to seek a solution to the structural and financial difficulties in the gas sector," the report said. The commission took a swipe at former Prime Minister Yulia Tymoshenko for failing to implement gas sector reforms to which she had agreed with the EU executive and international financial institutions last July as part of a standby lending package. "The new Ukrainian president will now need to take urgent steps to improve economic and financial stability by cooperating closely with the IMF to allow for the disbursement of the remaining IMF funds," the report said. The options for easing troubled East-West energy relations include European businesses storing gas in Ukrainian facilities, splitting Ukraine's domestic pipelines from transit pipelines to Europe and creating a consortium to operate the Ukrainian gas transit system. "None of these options has so far attained sufficient support from all involved — EU and EU gas industry, Russia/Gazprom and Ukraine/Naftogaz," the report said. "The new president is, however, now advocating the establishment of a consortium between Ukraine, Russia and the EU for the operation of the Ukrainian gas transportation system." In Kiev, meanwhile, Yanukovych raised hopes of the stability of the hryvna by announcing that he would keep Volodymyr Stelmakh as central bank chairman. "Changing the head of the national bank does not figure in my plans for the moment. Stelmakh must work," Yanukovych said Friday at a meeting with Ukraine's newly formed government. The head of the central bank, whose appointment is one of the president's few direct prerogatives, is central to attempts to stabilize Ukraine's chaotic internal finances and will be a key figure in resumed talks with the International Monetary Fund. Prime Minister Mykola Azarov, whom the parliament voted into office Thursday, has said he wants to get a suspended IMF $16.4 billion bailout program back on track soon to shore up the economy. Stelmakh, 61, is a veteran of the Ukrainian banking world and has worked in senior posts at the central bank for more than 15 years. He has twice been its chairman, this last time for more than five years. In a related development, new Finance Minister Fedir Yaroshenko said Saturday that Ukraine was not on the verge of default despite severe budget holes. Ukraine needs to find $3 billion to $5 billion a quarter to cover budget spending, and Yaroshenko confirmed that the government would stick with its social obligations despite empty state coffers and rising public debt. He did not specify the potential sources of the funds the country needs to make up for the budget shortage.